Stop to spend hours a day updating product stock quantity manually. Automate this process to save time for more important business tasks. Choose the parameter for inventory management. Import CSV file for mass stock status update. Up-to-date information of stock quantity is extremely essential for your web store success. It carries great impact on customer retention and loyalty. That's why it's very important to effectively manage stock in Magento. Use Inventory Management extension for quick and easy Magento stock updates. Save tons of time you spend on this routine manual process. It takes a couple of minutes to install this simple but pretty efficient magento inventory management software. As soon as you run the Inventory Management extension in Magento, the “Smart Stock Update” button will appear on the Manage Products page. With the help of the button you can update product stock info just in one click. 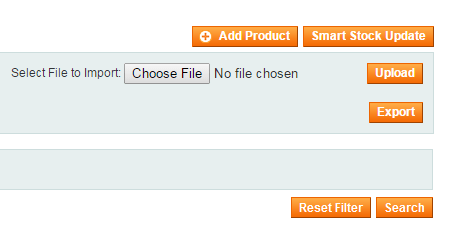 Along with the “Smart Stock Update” button on the Manage Products page you can find the “Upload” button which enables fast import of CSV file with actual stock information. Magento inventory control tool places current inventory in CSV file to the table with two columns. The first column indicates item SKU or ID and the second one shows the quantity of defined products. 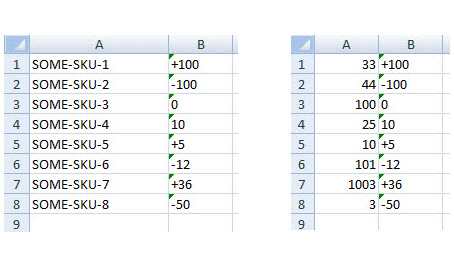 The picture below demonstrates CSV file examples. To manage stock in Magento even more effectively and easily update stock quantity, you can apply either absolute or relative values (marked with +/- symbols). Absolute values define the total amount of a certain product in the stock. Relative values determine how much items you need to add to the current amount on web store or subtract from it. Enable direct database import to make it much faster for large amounts of product data. Data re-indexing is important for maintaining your databases' health, but can be time-consuming. Use automatic re-indexing option to keep database tables up-to-date and save your time. Extension is well-written; it works in a very intuitive way. I was concerned about how to generate a .csv file – this data format may be tricky sometimes. Luckily, for this plugin I just need to put together a very clear document. Creating the file doesn’t take long, and the rest of the inventory management the ext will perform automatically. Brilliant, if you ask me! We got everything we wanted from this extension. It doesn't require any specific knowledge to be installed or to be managed. You just need to create a correct CSV file and timely update your stock. Since we installed it we haven't noticed any inaccuracies, conflicts or bugs, so we highly recommend this module! This easy, but very productive tool helped us combat endless customer complaints to irrelevant stock status. Having placed more than 2k items in our store, we couldn't timely manage our inventory. Despite some conflicts with a 3d party app we'd installed before, I award this module 4 stars as it works smoothly and does everything it should do. Thank you guys!